At The Chef’s Hat, we’re all about having a good time in the kitchen, and learning something new along the way. Or, create a great Group Event that your team, family, or friends won’t soon forget. 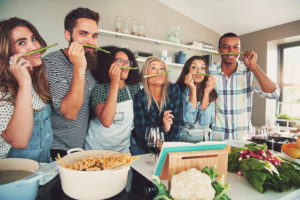 We’ll put together a session that helps you build camaraderie and cooperation, celebrate a special occasion, or just give your crew a foodie good time. Whatever you choose, you’ll enjoy a cooking event that’s more than just a boring demo. All participants get to be hands-on every step of the way, dicing and slicing their way to culinary victory. They get to taste everything they prepare, and wash it down with an adult beverage. We guarantee that you’ll have fun, whether you attend one of our themed cooking sessions, or participate in a group event. Get the scoop on classic brunch dishes, like Eggs Benedict, Lemon Ricotta Pancakes, Brisket Hash…and wash it all down with the perfect Mimosa. Bring your beloved and get to work preparing the perfect romantic meal. The couple that slices and dices together laughs a lot more than the couple that just sits and eats! Stressed out about cooking a Thanksgiving Feast? Don’t despair! We’ll break it down for you, step-by-step, and give you the recipes, timeline, and confidence you need to slay on Turkey Day.